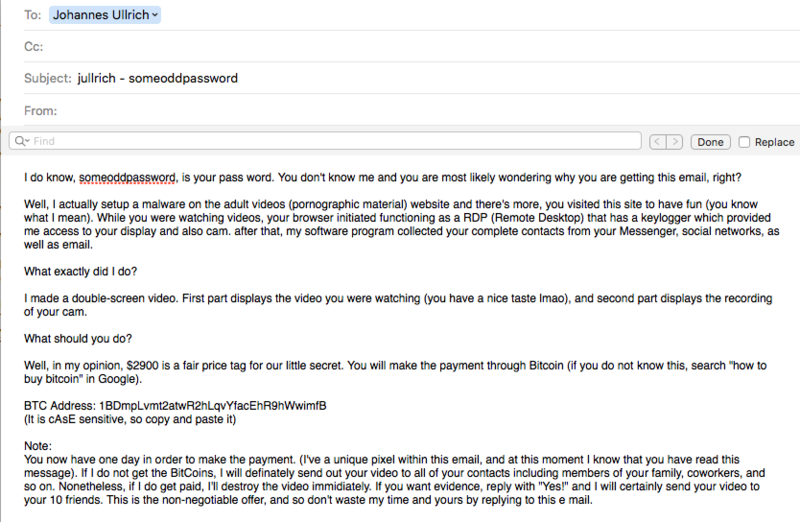 For a while now, we have seen sporadic extortion emails that claim to have a video of you watching pornographic material. The emails usually count on the guilt and shame of the victim to convince them to pay up. However, the bad guys, of course, do not have any evidence of their kompromat, which makes the extortion weak. You would expect them to at least include a frame from the video. Short of actually producing the video, I just saw another trick used to make the threat more plausible. The e-mail now includes a username and password that you used on *some* website. The bad guys are harvesting leaked account lists, and use them to make their threat more plausible. I include a screenshot of such an email below. "someoddpassword" was a password I used on some sites in the past. Kind of my throw-away password for a while, and I know it leaked in more than one breach. The emails also include some random text at the end which is typical for spam to evade spam filters. I did not reproduce that part in the screenshot. The copy I received was plain text and did not include any images or other trackers as promised.